Heat a pan, add butter (or olive oil) and when it melts, add cooked asparagus sticks and saute for a minute. Add sweet corn and saute well. Add 2 cups stock and allow to boil. Mix cornflour in 1/2 cup stock and add little by little to the boiled soup till it reaches the required consistency. 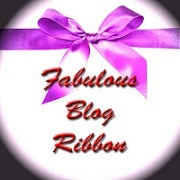 Sanoli from Sanoli's Kitchen and Beena from Cooking at Mayflower shared "Fabulous Blog Ribbon" award with me. Thanks a lot dear friends for this award. They both have a lovely space, do visit their space for yummy recipes.. I would like to pass this fabulous ribbon award to following blogger friends..
Asparagus and sweet corn soup looks delicious, congrats on your award. Very comforting and delicious soup.....Congrats on your awards.....wish you many more in future. A flavorful soup there Shabbu. Congrats on your award.. soup looks yummy and delicious..
Congrats Shabs on the award and delicious soup. This is very healthy and comforting soup, Congrats on your award. Congrats on ur award Shab, wat an ultimate combo, soup looks hearty and healthy. great soup.. never had asparagus.. will save this recipe to try sometime. Asparagus soup is a healthy choice in soup,yummy!! Congrats dear. Soup looks really inviting and yummy!